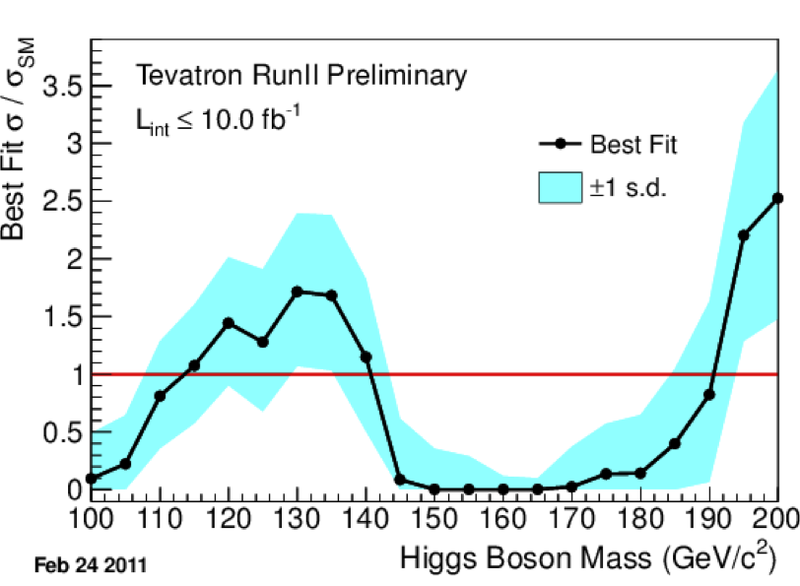 The significance of the low mass Higgs excess at the Tevatron increased much more than expected, given a tiny amount of data added since the previous combination. 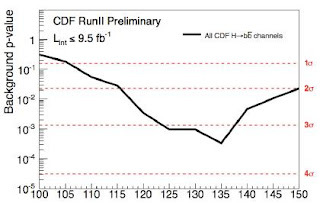 As explained at more length in my previous post, most of the steam comes from the improved b-tagging efficiency in CDF, which greatly helps to pick the H → bb signal. 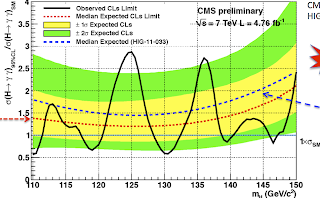 All in all, the Tevatron now reports a ~2.5 sigma excess in the interesting mass region between 120 and 130 GeV, although the poor mass resolution does not allow them to clearly favor any particular mass in that range. The excess is somewhat larger than predicted by the Standard Model Higgs, with the best fit value around 1.5 standard cross sections, however the standard cross section is within the 1 sigma band. 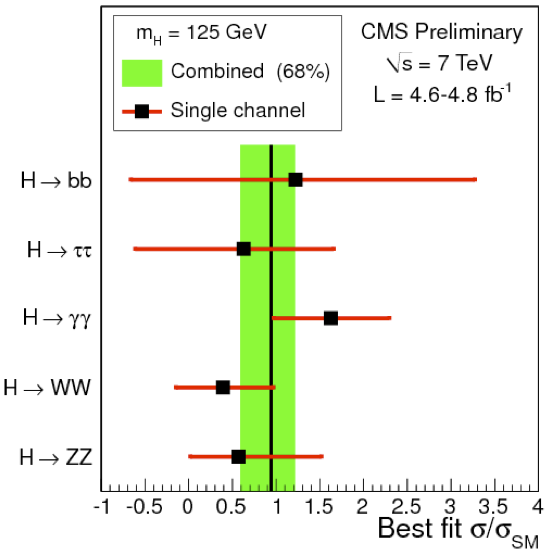 It is also interesting to have a look at the separate H → bb search channel where for a few more months the Tevatron is still superior to the LHC. In that channel alone the excess is even larger than in the full combination, corresponding to a ~3 sigma local significance. You should not pay too much attention to the fact that the best fit cross section on the right peaks at 135 GeV. Due to the poor mass resolution, 120 and 135 GeV Higgs looks about the same to the Tevatron, however the heavier Higgs the smaller the predicted event rate so one needs a larger boost to explain the same number of observed event. 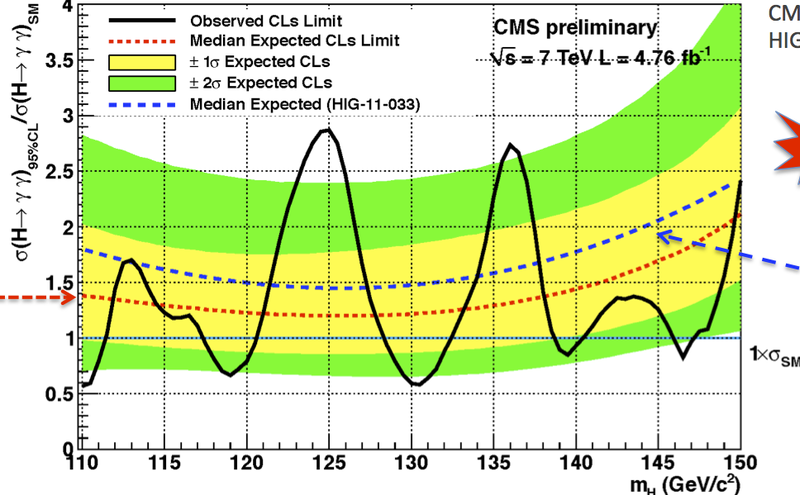 This can be better seen on the CDF plot of the p-value on the left: the significance of the excess over the background is about 3 sigma for any Higgs mass hypothesis between 125 and 135 GeV. 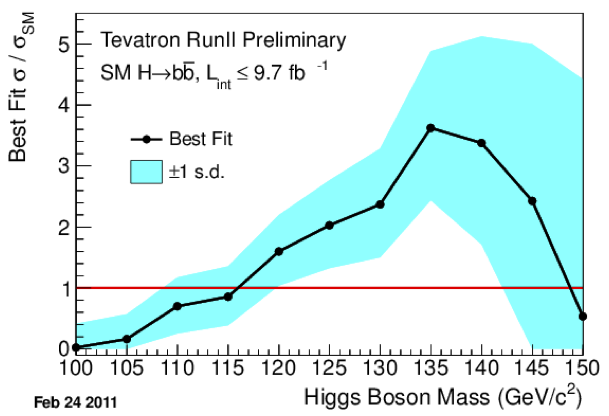 What is more interesting is that near 125 GeV Higgs the observed signal strength is noticeably higher than the one predicted by the Standard Model, with the best fit around twice the Standard Model cross section. And that is mildly exciting. Although CMS fired most of their guns in December (having updated most channels to the full 5fb-1 statistics back then) they keep making small improvements in the analysis. One noticeable improvement presented today is in the diphoton search channel, thanks to a new fancy multivariate analysis whose expected sensitivity (red) is much better than that of the previous cut-based analysis (blue). Thanks to that the diphoton signal around 125 GeV grew a bit stronger and now corresponds to a p-value of almost 3 sigma. At the same time they are able to exclude the Higgs mass in the windows of 117.5-­120.5 GeV and 128.5-­132.0 GeV. 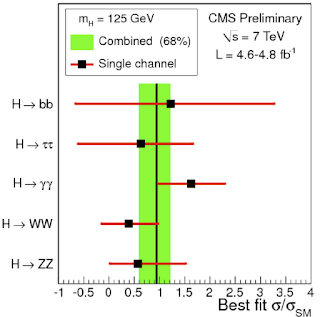 CMS also presented a nice graphics showing how the 125 GeV Higgs signal splits between different search channels. We see that we're getting a bit too much signal in the diphoton channel, and a bit too little signal in the WW and ZZ channel, but otherwise there is a decent agreement with the expectations from the Standard Model Higgs. If ATLAS provide an analogous plot it would look similar, except they have a somewhat stronger signal in ZZ and weaker in WW. The LHC has does not yet have enough sensitivity to the Higgs decaying to fermions (unlike the Tevatron), and thus the b-bbar and tau-tau channels currently do not provide any meaningful insight. 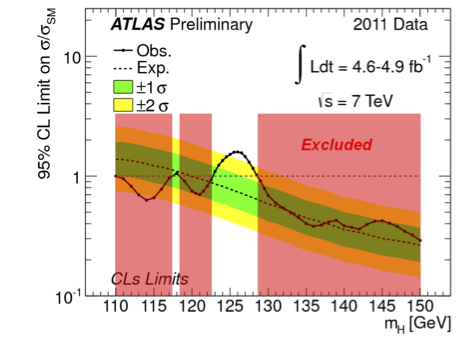 For more reports on today's Higgs updates, see Tommaso, Philip, Matt and again Matt. Right, it's surprising that the experiments have agreed to that folly. The speakers must have been threatened by the organizers, like, I don't know, their ski-pass would be canceled if they used the word Higgs. In any case you chose the wrong conference to go to!